Shopping for yourself is easy. Giving intentional, conscious gifts is a lot trickier. I personally try to think of thoughtful and meaningful gifts for loved ones that will make them feel valued and appreciated. A great way to give intentionally this year is by choosing to support a brand that stands for something- whether it’s artisan-made, sustainable, upcycled, organic, or made in the USA. I’ve included a few pieces that I think will make thoughtful, intentional gifts! A lovely simple gift that adds a lot to the table. 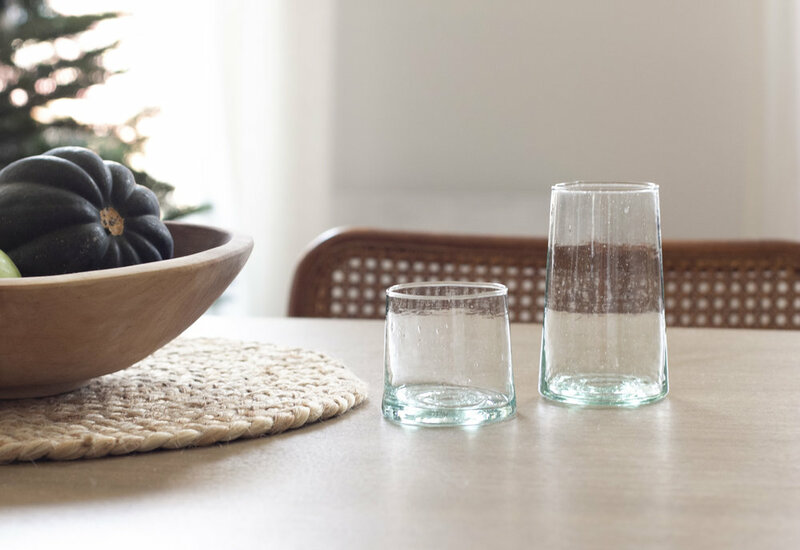 This elegant recycled glassware doubles as cocktail or wine glasses—handmade in collaboration with Moroccan artisans. This earthy organic hand cream is a luxurious and practical gift for the winter season. With top notes of marjoram, mid notes of palmarosa & rosemary and base notes of vetiver & lavender. Made of plants, grasses and seaweed. Austin Austin’s bottles are made from 100% recycled material and their boxes are made from FSC accredited sustainably managed forests. All of their packaging is recyclable. A well-made notebook is a simple, thoughtful gift for that one person who is hard to buy gifts for. Appointed Co creates handcrafted notebooks in several beautiful colors, made in the US with sustainably sourced materials. These soothing winter scents create perfect cozy gifts for the holidays. Siblings Sara and Sean created Vitruvi as a collection of 100% natural essential oils that would help promote mindfulness and natural selfcare practices. Eco-chic kitchen tools and stainless steel reusable straws make ideal stocking stuffers! This Dish Brush has fully compostable brush heads which can be replaced. CLED creates upcycled handcrafted jewelry using sustainable, cruelty-free and discarded materials. CLED uses beautiful recycled, biodegradable packaging printed with environmentally friendly inks— perfect for gift giving! These subtle statement earrings are sterling silver, hand-crafted glass repurposed and upcycled from discarded glass bottles. Written by founders of CAP Beauty, 100% plant based and gluten free recipes and rituals for a life of radical health and self-care. A great coffee table book for a health-conscious foodie friend! J.Hannah’s beautiful non-toxic nail colors come in several muted shades that are a guarantee hit for your neutral-loving friend or family member. All J.Hannah polishes are seven-free, highly-pigmented, cruelty-free and made in the USA. The Scrunchie is back! A Silk scrunchie is such a fun statement piece- a perfect little gift for a sister or girlfriend. Winden’s 100% Upcycled Silk Scrunchie is created entirely from the premium, naturally dyed textile remnants left over from Miranda Bennett Studio. James Street Co is a small batch knitwear brand based out of Utah that makes beautiful knitwear sets for children and adults and the most adorable beanies. The Adult Port Beanie is 100% soft merino wool ethically made in LA. The Burnt Sienna Beanie makes a thoughtful gift with the perfect pop of color for the holidays.